The Russian Communist Party have announced an independent investigation into the death of parliament member Viktor Ilyukhin - one of the most famous Russian communists known for harsh criticism of the authorities. ­One of the oldest leaders of the Communist Party of the Russian Federation, Viktor Ilyukhin, died at his Dacha near the town of Zhukovsky in Moscow's suburbs. According to media reports, the parliamentarian suddenly felt ill on Saturday evening and the ambulance arrived too late to save him. At the same time, all those who new 62-year old Ilyukhin unanimously agreed that he had no health problems and his death came as shock. The Main Investigation Directorate of the Investigation Committee for Moscow Region announced on Monday that it was holding a preliminary probe into the death of State Duma deputy Viktor Ilyukhin. However, the colleagues of the late legislator said they needed a full-scale investigation, not just a preliminary probe. State Duma deputy from the Communist Party Aleksandr Kulikov said that Ilyukhin had taken a radical stance in many political disputes and never feared to criticize the authorities often using real facts when accusing officials of criminal activities. Kulikov said on Monday that according to the official autopsy results Ilyukhin died of a heart attack that had been developing for several days and entered its critical phase on Saturday. The leader of the Communist Party, Gennadiy Zyuganov, said that his party had organized an independent investigation into Ilyukhin’s death. “We do not suspect anyone, but we want to establish the real cause of his death,” Interfax news agency quoted Zyuganov as saying. The communist leader reminded that Ilyukhin’s political activities irritated certain circles. “He was the main reporter when our faction initiated the impeachment of President Yeltsin. He presented the Katyn investigation materials. Quite recently he demanded to investigate the government’s role in the practical destruction of three military divisions and so on,” Zyuganov said. Ilyukhin was one of the most well-known and popular of Russia’s parliamentarians. He first became famous in the early nineties when he started a criminal case against the President of the Soviet Union Mikhail Gorbachev for high treason and almost immediately after that lost his post as the head of the department for observation of laws on state security of the Prosecutor General’s Office of the Soviet Union. 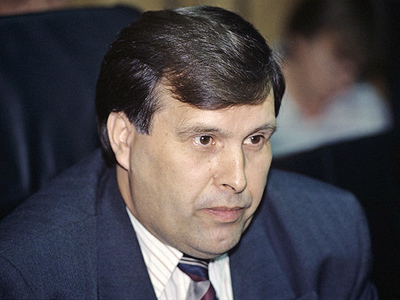 Ilyukhin supported the parliament in the 1993 standoff with president Yeltsin, but retained his post as a deputy and became the head of the parliamentary commission on state security. In 1998 he was the main reporter when the parliament tried to impeach President Yeltsin. Ilyukhin was a close friend of another Russian politician, General Lev Rokhlin, the head of the Civil Movement for Support of the Military. Rokhlin died in suspicious circumstances in 1998 and Ilyukhin became the head of the movement since then. Over the past few years, the late deputy had been working in the Committee for State Building and became known for his role in writing many key bills, such as the new criminal and procedure codes as well as draft laws regulating the work of power agencies.